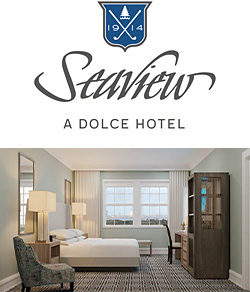 Seaview, a Dolce Hotel - part of the renowned meetings and events brand Dolce Hotels and Resorts by Wyndham - today announced plans for a transformational renovation updating its 296 guest rooms, event spaces and dining outlets with modern design inspired by the hotel’s celebrated Jersey Shore history. The renovation comes on the heels of new ownership for the hotel, which was sold in August 2018 to Dr. Kiran Patel, Florida philanthropist and Wyndham partner on landmark hotels including the striking Wyndham Grand Clearwater Beach in Florida and prominent Dolce Cheyenne Mountain Resort in Colorado. The $17 million renovation will include updates to all 296 guestrooms and suites; refreshed meeting spaces, lobby and public areas; renovations to the outdoor pool; and new dining options including a new original restaurant concept within the hotel’s famed Oval Room. To sustain the massive renovation, guest rooms and meeting spaces will be closed to visitors for the winter months, reopening starting in March 2019. The hotel’s golf course remains open. Founded in 1914, the historic Seaview Hotel has hosted famed names such as Presidents Warren G. Harding and Dwight D. Eisenhower, The Rolling Stones, Bob Dylan and Grace Kelly - who in 1946, celebrated her sweet 16 party in the resort’s legendary Oval Room. This history inspires the hotel’s redesign, which includes a hint of art deco nostalgia – a playful nod to Atlantic City’s heyday – paired with cool, coastal blues and modern, comfortable furnishings. The coastal motif carries into the hotel’s 27,000 sq. ft. of event space, which caters to a variety of social events with customizable menus and packages for weddings with both indoor and outdoor ceremony venues, bar and bat mitzvahs, family reunions and fundraisers. As part of the Dolce brand, Seaview will also offer state-of-the-art meeting facilities across 21 meeting rooms designed specifically to stimulate productivity and creative thinking. The hotel offers Dolce’s signature Nourishment Hubs, rethinking the cliché afternoon coffee break with fresh, energizing refreshments throughout the day as well as its “Thoughtful Foods for Thoughtful Minds" program offering menus with wholesome ingredients and convenient, flexible options. Meeting planners at Seaview, a Dolce Hotel, benefit from Wyndham’s go meet, a formal rewards program catering to both professional and casual meeting/event planners. Planners who are members of the Wyndham Rewards loyalty program can earn one point for every dollar spent on qualifying revenue, regardless of billing method, with no minimum spend requirement and no maximum point limit. On average, meeting planners earn 45,000 points per meeting—enough for three free nights at any of Wyndham’s hotels around the world. Picture caption: an image of the new room design at Seaview, a Dolce Hotel, invoking cool, coastal blues inspired by the sea and featuring modern furnishings and amenities for guests in 2019. Mere minutes from the excitement of Atlantic City yet quietly tucked away on 670 scenic acres along Reed’s Bay, Seaview, a Dolce Hotel, offers 296 well-appointed guest rooms and 27,000 square feet of meeting space in a pristine, retreat-like setting for both business and leisure travelers. And, with 36 holes of golf, indoor and outdoor pools, tennis courts, and a world-class spa, guests will discover inspiration beyond the boardroom. Convenient to the casinos and entertainment of Atlantic City while being only 45 minutes from Philadelphia, historic charm abounds at Seaview across a century of history and tradition merged with contemporary conveniences. Inspirational environments foster big ideas. That’s the philosophy behind Dolce Hotels and Resorts by Wyndham®. A curated collection of unique destinations, Dolce redefines modern meetings using creative spaces, state-of-the-art technology, nourishing food and beverage programs and inspired activities. From Napa Valley to the French countryside of Chantilly, Dolce’s breathtaking locations provide the backdrop to incredible travel experiences, whether in a meeting or relaxing at its award-winning golf courses, rejuvenating spas and nearby world-famous wineries. Follow @dolcehotels on Facebook, Instagram and Twitter.